When planning an event, trade show, Convention, product launch or simply want to divide a room. We have many pipe and drape options. At Del Rey Party Rentals, we have a large inventory of p&d hardware and drapes. Check out our broad range of pipe and drape, including many color options. 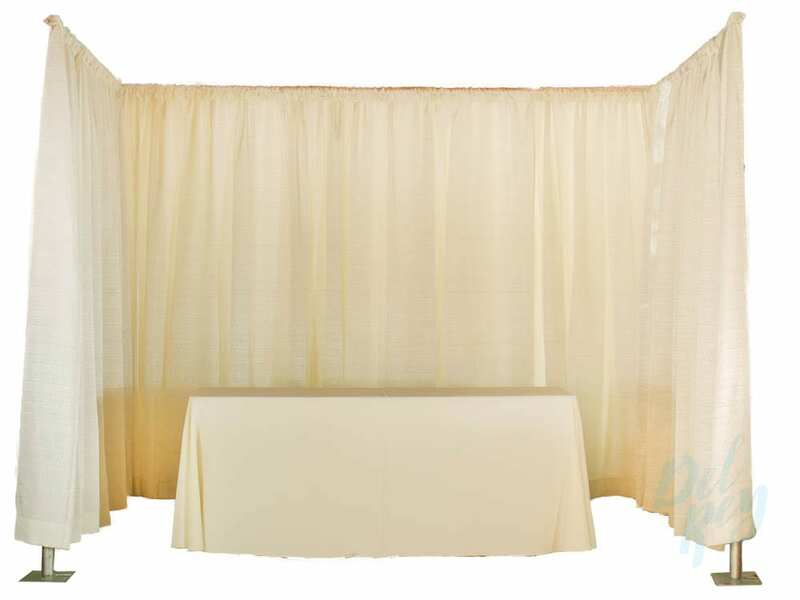 We have drapes in white, gold, ivory, black, blue and red. Different fabric options are: Duvetyne, banjo, velvet, voile, plain & solid colors. In addition, browse our lighting options to complete your décor or add a stage or platform to make your gathering look more professional. An online quote can help you get one low price for everything you need, since we are your one-stop event rental company! HEIGHTS AVAILABLE: 8′ HIGH to 21′ HIGH. (please call for pricing information) . Pipe and drape hardware rentals includes: Bases, regular uprights, telescopic uprights, telescopic crossbars and sand bags. If you are a productions company or rental company looking for additional hardware. Call us since we stock hundreds of telescopic uprights and crossbars we can help as much as possible.